Minesworn | Legacy Forum Boards (Archival) | Support and Help | A tutorial about guns. This is a tutorial about the guns we have on MineSworn. They are very simple and will take no longer than a few minutes to read. You can revisit this link as many times as you need if you forget, but there are also helpful reminders at spawn. Before we start, it must be mentioned that ALL guns are fired using the LEFT-CLICK. So hold a gun in your hand, and LEFT-CLICK. 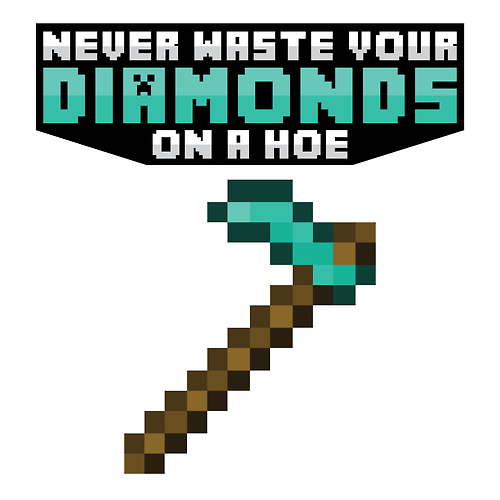 The most common guns on MineSworn are all hoes (gold hoe, iron hoe e.t.c) and each has a corresponding ammunition source, which will be explained below. All guns are available to all players and can either be crafted, found, or bought in the spawn shop or from other players. What guns do we have, and what ammunition do they require? -First up, we have the pistol. The pistol is simply a wooden hoe, and the ammunition for this gun is SNOWBALLS. It is a short-range weapon that packs a nasty punch if you can get it's hideous accuracy under control. -Secondly, we have the shotgun. The shotgun is simply a stone hoe, and the ammunition for this gun is SEEDS. It is a short-range weapon that can have devastating effects up close! -Thirdly, we have the sniper. The sniper is simply a gold hoe, and the ammunition for this gun is FLINT. It is a long-range weapon with a high damage output and can have monstrous impact in a battle. Sit back, snipe off your enemies and enjoy their loot fly all over the ground. -Fourthly, we have the rifle. The rifle is simply and iron hoe, and the ammunition for this gun is CLAY BALL. It is a mid-range weapon with a high damage output and can be influential in a victory. -Fifthly, we have the rocket launcher. The rocket launcher is simply a diamond hoe, and the ammunition for this gun is TNT. It is a slow-moving medium-range weapon that has an explosive blast radius capable of knocking players back many blocks. -Sixthly, we have the flamethrower. The flamethrower is simply a flint n' steel, and the ammunition for this gun is NETHERWART. It is a short-range weapon capable of burning foes to a crisp. - Seventhly, we have the machine gun. This gun is simply an iron horse armour, and the ammunition is GOLD NUGGETS. It is a mid-range weapon with a high damage output and capable of firing many shots in quick succession. -Finally, we have the crossbow blaster. This "gun" is simply a bow, and the ammunition is REDSTONE DUST. It is a long-range weapon with an explosive element to it. It doubles up as a regular bow, as well as an explosive crossbow. Hopefully this helped you learn about the guns, if you need any more help, you can always ask the friendly staff online for more information!